John Lewis is using augmented reality to enable customers to try clothes on virtually, as part of its multichannel offering. 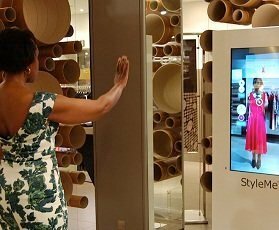 The two 6ft by 3ft StyleMe mirrors developed by Cisco, each has bespoke built-in 3D cameras to capture shoppers’ dimensions and position in order to superimpose a virtual outfit over their ‘reflections’. The mirrors were developed in partnership with retail technology firms C-instore, Aitech and The Team. Cisco said it intends to upgrade the mirrors to include better cameras and more integrated social media tools. The interactive screen enables the customer to choose from 500 John Lewis jpeg images. Shoppers can then create a virtual collection which they can opt to have emailed to them, including images and QR codes. John Lewis said it would consider rolling out the mirrors in other stores if the six-week pilot is a success. The company already has designated multichannel points around its Oxford Street store, enabling customers to buy items online or collect from other branches. The retailer recently said it was looking to recruit 30 IT experts to integrate its “multi-channel customer service”. Over the next three years its IT strategy includes uniting all purchase routes, such as Click and Collect, kiosks, instore iPads, call centre, online store, mobile app, Facebook and Twitter.